Tough Over Time, TEKTON® Geotextiles preserve the original design and design life of your construction project. One of our styles is sure to be perfect for your needs. 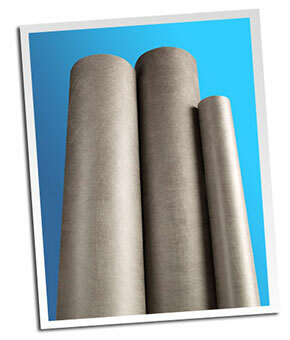 Long-lasting, durable, nonwoven fabrics, excellent for many construction end uses, TEKTON® Geotextiles are continuous filament, heat-bonded fabrics with superior uniformity. Manufactured from high quality polypropylene, TEKTON Geotextiles stabilise your construction project as they separate aggregate and subsoil and filter soil particles while letting water pass through. 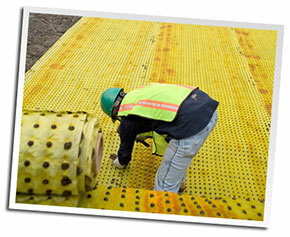 The TEKTON® Biobarrier® system is a unique method of root and weed control originally created in response to the United States Department of Energy’s need for a product that could be used in the closure cap of hazardous waste sites to prevent root intrusion and any possible chance that hazardous waste could get into the food chain. The product manages roots through the slow, controlled release of trifluralin, a root inhibition herbicide that has been in use on food crops for more than 35 years. A pattern of 11mm hemisphere nodules is through-injection-molded to 135 grams per square meter, durable, proven TEKTON® geotextile fabric on 38mm centres. This creates a continuous zone of root control protection. Trifluralin diffuses from the protective nodules in vapour form, creating a root inhibition zone in the soil. Roots penetrate the zone until root tips reach the herbicidal concentration that prevents that species’ root tip cell division; this is normally 9.5mm from the fabric. Inhibits tree, shrub and weed root growth into irrigation systems, sidewalks and parking lots, green roofs, landscaped areas, building foundations, levees, tennis courts and golf courses, pot-in-pot nursery trees and much, much more! TEKTON® Biobarrier® Root Control System and TEKTON® Biobarrier® Weed Control System are not available in all markets. TEKTON® Geocells are a unique new confinement system consisting of a series of heavy-duty geotextile fabric cells in a honeycomb formation. Each unit has a 3-dimensional cellular design that allows for custom sizes, configuration and adaptability to irregular terrain. The products’ hydraulic properties are influenced by the type and compaction of the fill material. Each unit is folded into an accordion shape so it is easily transported and constructed. TEKTON Geocells are expanded on site and filled with a ballast material such as sand, stones, all soil types, mulch or other material. The product functions as a coherent single unit and can be joined end-to-end or side-by-side without fear of joint failure. TEKTON Geocells can be built into self-supporting higher walls by stacking one unit on another filled unit in a vertical or setback fashion. The resulting barrier is stable, strong and durable. 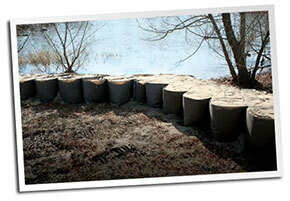 For information on other Fiberweb geotextiles, please visit Terram.com.